There are a limited number of reserved electrical hookup campsites providing 30 Amp, 20 Amp and 10 Amp service. No A/C or high power usage devices in the 10 Amp Electric Sites. Please, no daisy-chaining. Only campers who purchase electrical hookup may camp in the designated electrical sites. This year, all electric hookup sites are pre-assigned during participants order. 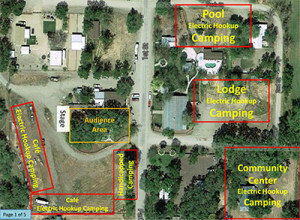 Click here or on the map to the left to download a PDF camp site map. Other areas for camping are on a first come, first served basis. We have dozens of acres of ‘open’ dry camping in the ‘Boondocks’ area across the cattle guard near the community center. There are no designated sites, just find a place to camp & set up. Please do not ‘reserve’ space for those arriving later. The Bluegrass Music Society of the Central Coast welcomes you to the 21st annual Parkfield Bluegrass Festival. BMSCC s Board of Directors and festival personnel ask that you cooperate with guidelines governing conduct of attendees. Please read the following rules and regulations carefully. By following these simple guidelines, we all can enjoy our festival days together in harmony and enjoy some wonderful music! NO connecting to facility on-site power sources. The Festival Grounds has adopted a ‘No Drone’ policy which will be strictly enforced. This year we are very excited to present QUAKE Radio that will be broadcasting the happenings at Parkfield Bluegrass Festival! Tune in May 9th – 12th! 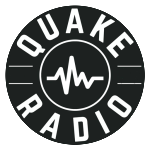 Be sure to bring a portable radio and tune in to QUAKE Radio. A camping unit comprises a campsite with tent(s) and no more than two automobiles or camping vehicles (motor home, trailer, etc.). Camping included with Multi-Day Festival ticket purchases. Due to the expected continuation of the drought, no open fires or any open burning, including camp, charcoal, and cooking fires, are allowed. Propane heaters & stoves are fine. Please be careful. Fire danger will be high. Pets are welcome at the festival, but not in the audience area. They must be kept on a leash, quiet & under the owners control at all times. Festival staff reserves discretion to have unruly or uncontrolled pets removed from site. A service animal may assist its owner while in common areas provided the animal behaves appropriately and unobtrusively, Each such animal shall be kept on a leash, in a carrier, or otherwise under the direct control of the animal owner. For the safety and pleasure of neighboring campers and RVers, a generator diversion exhaust system is required for all onboard generators. The exhaust system shall redirect exhaust exiting above the top level of your RV reducing the noise and divert harmful exhaust fumes away from the ground, where they are often inhaled by neighbors. Please be very considerate if using an external generator. Some type of sound baffling may be necessary. Fumes can be a problem here too. Remember, your neighbors may be in a tent. If the use of a generator is deemed to be unreasonably loud or smelly by the facility staff, use of the generator may be limited &/or prohibited. Hours of operation are 9 AM to 9 PM. Email: Click on this link to use our Contact Form.